The sukkah has returned to Washington Square Park. This year, Sukkot is observed from October 8 to October 15. Sukkot is a harvest festival and building a sukkah is the first step in celebrating the holiday. The sukkah must be located outdoors - "under the open sky" - with a vegetated roof and a minimum of two and half walls. The park's sukkah in 2011 was built by the NYU Chabad House. This year's sukkah has a similar design so I assume it was also constructed by the university Chabad House. 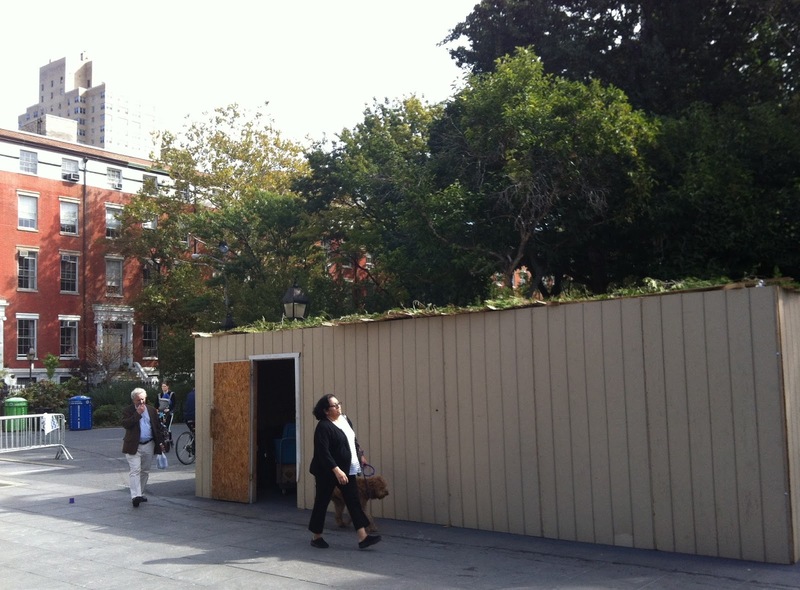 My introduction to Sukkot was the Sukkah City 2010 exhibition in Union Square Park. The twelve competition finalists displayed their sukkahs for two days. A couple of my favorites are shown below. For more photos, read Sukkah City in Union Square Park. Sukkot - the only Jewish holiday I have ever wanted to appropriate as my own. I hope there will be another Sukkah City competition.